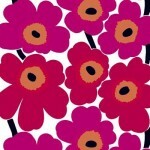 I am a big fan of Marimekko and their colorful Scandinavian designs. In the last year or so they partnered with Converse (another of my favorite things) to create a line of patterned sneakers. 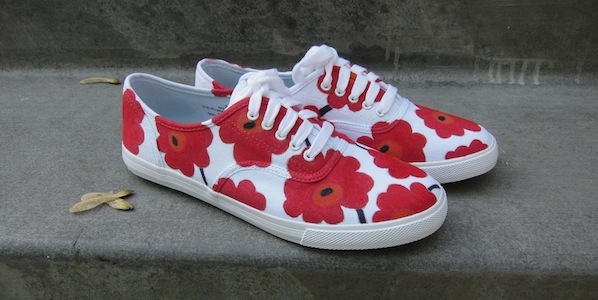 I’ve thought about getting a pair for awhile, but they are a little bit pricey and they didn’t have my favorite pattern, Unikko. (I see they do have that pattern now, but of course not in my size.) 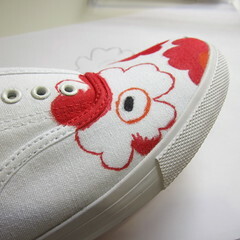 I mentioned to Matt that I should try painting the pattern on a pair of shoes myself and he said it would be too hard. Well, challenge accepted and accomplished. Also they are not painted. 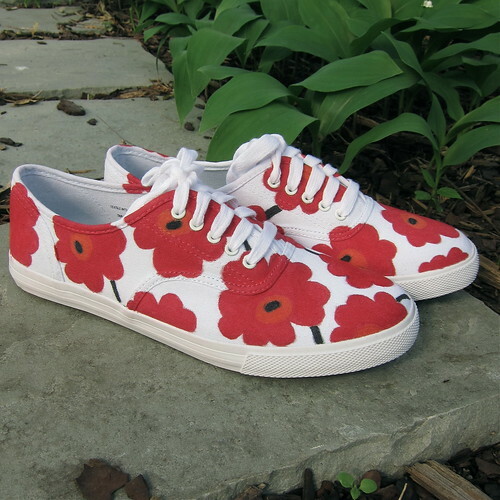 I did a little reading about painting your own sneakers, people suggested acrylic paint or fabric paint. I thought paint pens would give me the best control, but have found fabric paint pens to be a little too pale in the past. Sharpies on the other hand have nice bright colors, different size tips and are permanent. I tested them on a scrap of canvas and they looked great. The black ended up bleeding a bit on the sneakers, but that worked fine with the pattern. 1. Prep your sneakers – Remove the shoelaces from the shoes. If you wish you can tape of the edge of the soles with masking tape to prevent getting marker on them. 2. Practice your design – The Unikko design is perfect for this project because it is very free form and the colors blur together a little around the edges. 3. 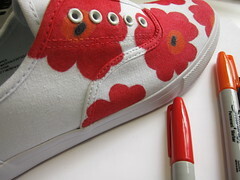 Draw on the basic flower outline – Use a pencil to lightly sketch the outline of your flowers on the shoes. 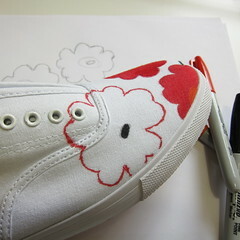 Then draw over the outline with the red marker. If you feel really confident you can skip the pencil and just use the maker, but remember it is permanent. 4. 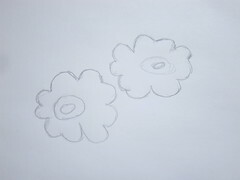 Color in the flowers – Draw in the black circle for the center of the flower, then an orange circle around it. The black tends to bleed a little so let it dry before you fill in the orange around it. Fill in the red petals and then the orange center. 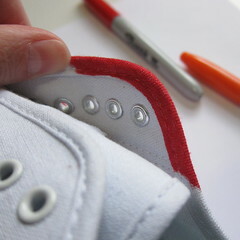 Use the point of the marker to get into all the seams and stitches of the sneaker. They will separate a little when you wear the sneakers so you want them to be colored in. 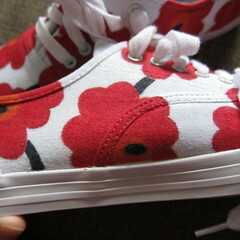 Make sure to follow the pattern around the edges of the sneakers. Draw in a few stems with the black marker. These are not sneakers that are made to get wet . I tested the sharpies on a scrap piece if canvas and it didn’t run when wet, so a few drops probably won’t hurt but I wouldn’t jump in any puddles or throw these in the wash. Think of them as your special occasion tennies. I may try spraying them with some silicone waterproofer for shoes. If I do I’ll let you know here how it works. If you make a pair of sneakers inspired by these we’d love to see them in our Flickr group. Kathy! I love love love these! 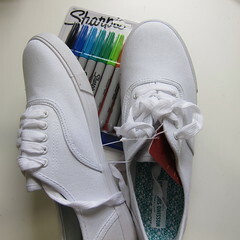 I never would have thought about using Sharpies, but it’s such a great idea. Fun summer project, and relatively inexpensive, too! Elle – I was so happy with how they turned out! 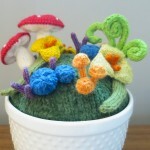 It would be a fun project for kids to create their own too. Lucas said he wants to make his own pair of shoes. Maybe we will try it this summer on a rainy day. They work on just about any fabric. On denim they give a nice subtle look that I just LOVE! Oh bacon & egg would be so fun! I had heard of the fabric sharpies, but was in one of those going to make this project NOW moods & didn’t search them out. Those look great! 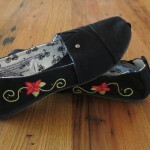 I’ve actually been wanting to paint a pair of TOMS. I know that’s pretty trendy right now and I have seen so many great shoes. I’ve been wanting to get some of the new fabric sharpies but haven’t been able to find them in stores. I’ve drawn on fabric with regular sharpie (like a t-shirt) and it does stay on if you wash it but it fades. I’m wondering if the fabric sharpie would hold up better. I almost bought the Crayola Fabric markers. I wonder how those work? I was worried they wouldn’t be bright enough. Awesome! This is such a fabulous idea, I might have to give it a try. 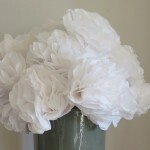 You can spray them with clear acrylic spray or mod podge them to protect them. Love your shoes! So flippin’ cute. I have to wonder why they did not do this particular pattern because it is so darn cute. I must make these. I have been watching You Tube videos of people doing sneakers similar to this. The sneakers look fabulous, I love the pattern. Thanks for sharing. 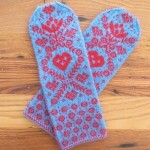 These look adorable and I’m having to resist from running out the door to find a pair to draw on right now. Did you end up trying to spray protect these? If so, did it work? I’d love to try this, but I tend to be hard on even my special occasion shoes. I didn’t spray them & wish I had as they did bleed a little. Sharpie makes fabric markers which shouldn’t bleed & I’m going to try them next time.